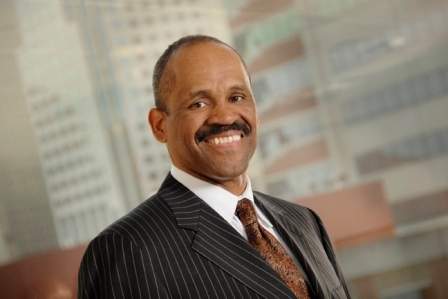 Victor B. MacFarlane, chairman and chief executive officer of MacFarlane Partners, has been recognized for his long-standing work in and commitment to urban real estate investment and development by the Greater Los Angeles African American Chamber of Commerce (GLAAACC). Mr. MacFarlane received the Lifetime Achievement Award in Urban Real Estate Investment and Development at GLAAACC’s 26th Annual Economic Awards Dinner, which was held on March 8 at the JW Marriott Los Angeles L.A. LIVE hotel in downtown Los Angeles. “I am deeply honored to receive this award. I thank GLAAACC Chairman Gene Hale and all of the members of the GLAAACC executive board and board of directors for their recognition of MacFarlane Partners and its urban real estate accomplishments,” Mr. MacFarlane said in accepting the award. Mr. MacFarlane, who has 40 years of real estate experience, founded MacFarlane Partners in 1987 as one of the first African American-owned real estate investment management firms in the United States. He pioneered the urban investment concept among institutional real estate managers in 1996, when his firm teamed up with Earvin “Magic” Johnson to form the first institutional real estate venture dedicated to urban properties. Since that time, Mr. MacFarlane and his firm have become industry leaders in urban/smart-growth development, having invested in $13 billion in urban properties that total eight million square feet of commercial space and 15,000 multifamily housing units in major cities nationwide on behalf of some of the world’s largest pension funds and institutions. In the Los Angeles area, Mr. MacFarlane has overseen investments in $4.5 billion in property development, redevelopment and renovation projects through his firm’s urban program. 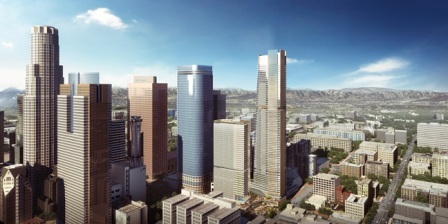 Past investments include the renovation and market repositioning of Ladera Center, an open-air shopping center in L.A.’s Ladera Heights neighborhood; the development of Hikari and Metropolitan Lofts, mixed-income rental apartments in the city’s downtown; and the development of the Hotel & Residences at L.A. LIVE, two hotels and residential condominiums that serve as the cornerstone of the L.A. LIVE entertainment complex downtown. Currently, MacFarlane Partners is completing construction of two adjacent rental apartment communities across from Pershing Square in downtown L.A. The two properties, Park Fifth and Trademark, will consist of 347 and 313 apartment units, respectively, and a total of 12,800 square feet of neighborhood-serving retail space. Both projects are expected to welcome their first residents by this summer. MacFarlane Partners also is one of three minority-owned real estate firms that are preparing to develop Angels Landing, a two-acre site on the east side of Bunker Hill, one block north of the Park Fifth and Trademark properties downtown. The firm and its two partners, Peebles Corp. and Claridge Properties, plan to build two high-rises that will include a mix of hotel rooms, retail space, rental apartments and residential condominiums, along with an outdoor public plaza and an early learning center. The $1.5 billion project is tentatively scheduled to begin construction in late 2021. Mr. MacFarlane began his real estate career in 1979 with Aetna Life & Casualty Company. In addition to receiving the lifetime achievement award from GLAAACC this year, he was honored as Executive of the Year by the organization in 2008. He also is a past recipient of the National Inner City Economic Leadership Award from the Initiative for a Competitive Inner City and a Distinguished Alumni Award from the Joseph M. Katz Graduate School of Business at the University of Pittsburgh, and holds an honorary law degree from the University of the District of Columbia. Property developments in which his firm invested have won awards from such organizations and publications as the National Association of Home Builders, the National Association of Office and Industrial Properties, the Los Angeles Business Council, the San Francisco Business Times and Los Angeles Downtown News. Two such properties—the Hotel & Residences at L.A. LIVE and the Time Warner Center in New York City—earned the prestigious Global Award for Excellence from the Urban Land Institute, an honor bestowed on a handful of properties worldwide each year. Mr. MacFarlane is one of the founding members of the Real Estate Executive Council, a professional trade organization that promotes the interests of minority real estate executives. He currently serves as an emeritus board member of REEC and on the advisory board of directors of the Robert Toigo Foundation, a non-profit organization that offers a leadership development program for minority undergraduate and graduate students focused on the field of finance. Mr. MacFarlane also sits on the board of directors of Site Centers Corp., the board of advisors for UCLA School of Law, and the board facilities committee of Stanford Hospital & Clinics. He is a member and former director of the Pension Real Estate Association and a member and former trustee of the Urban Land Institute. He holds a juris doctor degree from UCLA; a master’s degree in business administration from the University of Pittsburgh; and a bachelor’s degree in university studies from the University of New Mexico.